A Formula One season is never bereft of stories, and 2018 delivered its fair share of driver narratives. True, the grid was separated into two broad categories of competitiveness — the frontrunners and the rest, with Williams and McLaren taking it on turns to play backmarker — but from both categories emerged standout performances, both good and bad. Could there be any other? 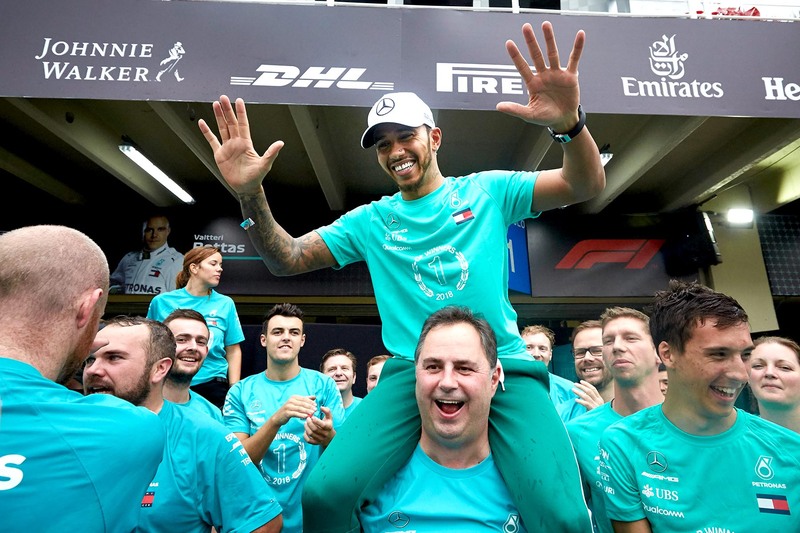 Lewis Hamilton’s 11 wins, 11 poles and record 408 points made him the season’s best driver statistically, but he also raised his game to well above the level of his rivals. This was the first season of Hamilton’s Mercedes career in which he faced a genuine external threat, and he thrived under the pressure. Subdued but error-free in the first half of the season, he built unstoppable momentum by midyear, winning eight of the last 11 races, including an indomitable run of six from seven between Germany and Japan, to emphatically claim the crown. Along the way he recorded some of his all-time great results, including a vintage wet-weather recovery from 14th to first in Germany, a relentless pursuit of victory in Italy and outstanding pole positions in the wet in Hungary and under pressure in Singapore. The 2018 season was Hamilton at his very best, and as much as Ferrari and Sebastian Vettel undermined themselves with unforced errors, Hamilton put them to the sword and earnt the title for himself. Charles Leclerc arrived in F1 with outstanding junior pedigree, having won the GP3 and Formula Two crowns on his first attempts in the previous two seasons, but not since Max Verstappen in 2015 — or arguably even earlier; since Lewis Hamilton in 2007 — has such a credentialed driver impressed so comprehensively. His shaky first three rounds have been long forgotten in the haze of his outstanding sixth-place finish in Azerbaijan and everything that happened thereafter. Leclerc went from strength to strength, ending the season with a 17-4 qualifying record against Marcus Ericsson and an immensely impressive seven Q3 appearances. Off track Leclerc has similarly impressed. A rookie he may be, but his mature demeanour outside the car, whether dealing with the team, the media or the fans, belies his age and has universally impressed. His promotion to Ferrari for 2019 after a single rookie season only underlines what Leclerc has already proven: he’s the real deal. Everything was coming up Valtteri in 2017 — a surprise call-up to Mercedes, his first F1 pole and victory and a respectable third in the drivers standings — but his expected 2018 consolidation went spectacularly wrong. Except for his strong start to the year, when circumstance deprived him of a possible three wins in the first four rounds, Bottas’s year was lacklustre at best. Finishing 161 points off adrift of Hamilton and behind both Ferrari drivers and even Max Verstappen, F1 motorsport boss Ross Brawn identified the Finn’s performance as the only “only slight flaw” in Mercedes’s season. Bottas is a confidence driver, and there’s little doubt that his sudden retirement from the lead in Azerbaijan and subsequent loss of points hurt him. Hamilton’s revival into title contention thereafter further damaged his psyche, and he finally crumbled when Mercedes forcibly relieved him of an easy win at the Russian Grand Prix to benefit his teammate. So severe was the bruising that Mercedes boss Toto Wolff said he was worried it had left his driver mentally scarred, and ahead of a decisive season in the Finn’s career, forgetting his 2018 campaign will Valtteri’s to priority during the off-season. Kevin Magnussen’s career trajectory had been in decline since his debutant McLaren season in 2014, but his second successive year with the improving Haas team turned the Dane into one of the midfield’s standout drivers — even if not always for the right reasons. Magnussen scored 56 of Haas’s 93 points, but it was his arrival as a consistently fast and confident driver that was most noteworthy. It’s been five years since Magnussen debuted in Formula One, yet 2018 was his first time he’d raced for the same team over two consecutive seasons. That sort of continuity can’t be discounted in the development of a driver, particularly after the Dane’s difficult first three seasons in the sport in which he was effectively sacked from McLaren twice and Renault once. But Magnussen made waves with his on-track clashes as much as he did with his results, putting what felt like every driver offside at some point this season with his brand of elbows-out racing. His unapologetic attitude injected a bit of extra life into the vibrant midfield. In any case, he received just two penalty points this season, the equal second-lowest tally of the year. The 2018 grid assembled in Melbourne was a strong one, with every driver able to mount a case for their inclusion in the sport, but by the end of the season some fell by the wayside. First was Stoffel Vandoorne, the junior McLaren superstar who failed to convert his feeder series titles into sufficiently strong F1 form to convince his team to retain him. But mitigating circumstances — McLaren’s internal turmoil and his partnership with world champion Fernando Alonso — set the Belgian up to fail, and he would fairly feel hard done by. Then came Sergey Sirotkin, the Russian F1 rookie who was let go for Robert Kubica. Understandable though the decision was for the team facing a technical and morale rebuild, he too would be justified believing a single year in the worst car on the grid didn’t allow him to showcase his talent. And finally came Brendon Hartley, he too an F1 rookie, albeit with two FIA titles from the World Endurance Championship. He was comprehensively beaten by Pierre Gasly, but his improvements over the course of his first F1 season begged for a second year to definitively decide whether his undoubted driving talents could translate into form at the top-tier level. Three drivers with a right to feel they deserve another chance — but then this is Formula One, where there can be no guarantees. But final word goes to Fernando Alonso, who retired — at least temporarily — from Formula One after four torrid seasons at McLaren. Throughout he remained a driving exemplar, taking a hopeless car to places it had no right being, but the driver hailed as his generation’s finest was only likely to stomach such paltry results for so long. His desire to challenge for victory — anywhere, against anyone — trumped the allure of Formula One, losing the sport an unwavering bar of racing excellence. Who were your standout performers — good or bad — in 2018?